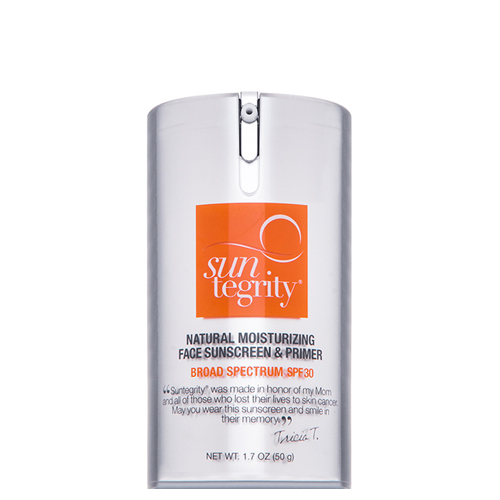 The Natural Moisturizing Face Sunscreen and Primer by Suntegrity Skincare is a 3 in 1 skincare product that functions as a face moisturizer, sunscreen and make-up primer all in one. Rich and non-greasy, it offers toxic free broad spectrum protection against damaging UVA & UVB rays. Additionally, it is infused with antioxidants that promote a youthful appearance, and has a light, uplifting citrus scent, making this Hero a skincare essential. Designed for all ages and skin types, the moisturizing face sunscreen provides broad-spectrum protection with non-nano size zinc oxide for effective protection without synthetic sunscreen ingredients. Acting as a non-greasy facial moisturizer and primer for makeup, it creates a clean canvas ready for makeup application – or not. Feather light but powerful, this SPF 30 sunscreen makes sun protection beautiful. Apply this moisturizing non-toxic sunscreen as the final step in your daily skin care ritual. Pump as much as needed to cover your face, neck and chest onto fingertips. Pat and press to apply evenly for complete coverage. Enjoy bare, beautiful, protected skin or continue with makeup application.